The script had already been written. From the moment Steven Gerrard announced his decision to venture across the pond, you just knew he was going to deliver a weekly reminder of everything we are going to miss. Against AFC Wimbledon he didn’t disappoint. Gerrard has put in so many of these displays over the years, we expect it. Some of us, to our shame take it for granted. Our number eight is now top scorer on nine goals this season, but tonight’s performance was about much more than that. His running belied his 34 years and he was everywhere, scoring two goals and heading one off the line as Mignolet stood stranded. This was the Steven Gerrard we fell in love with, marauding forward, battling back and ultimately deciding the game. Stripped of his holding duties in front of the back four the captain rolled back the years, ghosting into the box and bravely heading Javier Manquillo’s cross passed the sprawling Shea on 12 minutes. The stage seemed set for a comfortable win, with Wimbledon seemingly paying the reds a little too much respect in the early exchanges. Sadly the reds failed to put the tie out of reach in that opening period, and inevitably Wimbledon’s confidence grew. Liverpool’s defence has been writing game plans for our opposition all season now, and Neal Ardley showed he had been paying full attention. Wimbledon wasted no time in getting the ball into the box, and time after time we looked vulnerable. Skrtel, Sakho and Can all had impressive games but young Manquillo, unsurprisingly, seemed to struggle with the physicality of the game. On 33 minutes he failed to deal with a punt up the field from Shea and allowed the ball to bounce in the box. Matt Tubbs latched onto his mistake, but fortunately for Liverpool, failed to convert. Wimbledon were beginning to build up a head of steam. An equalizer was starting to feel depressingly predictable. In goal Mignolet was busy reprising his role as Jekyll and Hyde. As a shot stopper he is clearly up there with best, but on set pieces and crosses into the box he is terribly suspect. On 36 minutes the Belgian came out flapping at a corner, missed the ball completely, and was then beaten to it by Adebayo Akinfenwa, who gleefully slotted the ball home from two yards out. The BBC commentary team had been churning out the predicable one liners about his physique all through the half, but he beat the entire Liverpool defence to that loose ball. What a great moment for him, and richly deserved. At this point the stadium was rocking and all the noise was coming from the Wimbledon fans. Liverpool meanwhile returned to the nervousness that has characterised our season. Half time brought a sense of relief, and and a chance to regain our earlier composure. We were granted a rare glimpse into the Wimbledon dressing room to see a half time team talk, minus the sound. Great that Aunty Beeb, cheers. Meanwhile back in the studio the pundits were doing their best to ramp up the stakes for Liverpool and Brendan Rodgers in particular. 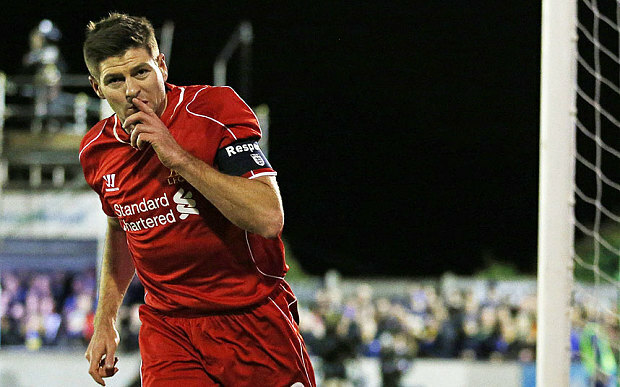 The media love the FA cup, and especially ties that pitch the minnows against the big fish. This is completely understandable. As long as it’s not your team, the sight of a David slaying a Goliath is always good value, However, Shearer and Linakar decided there was much more than this at stake for the reds boss. “What with everything that’s been going on at Liverpool lately they can’t afford to lose this one” said Shearer agreeing with the shows host that this was a ‘seminal moment’ for Liverpool. The Kop once chanted “you should have stayed on the telly” to a hapless shearer, who was watching his Newcastle team being annihilated at Anfield, during his ill-fated caretaker spell. I’m not sure we gave him good advice there. Wimbledon started the second half as they as they finished the first and the reds struggled early on to keep the ball. Inevitably though the League Two began to wane, and the Reds regained their grip on possession. In the 61st minute a clever turn by Coutinho drew a tired and reckless challenge from Barry Fuller. 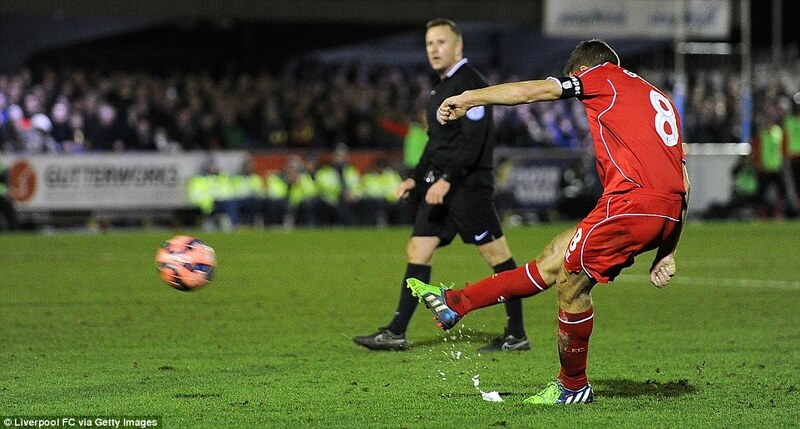 With the ball at his feet Steven Gerrard once again found himself with Liverpool’s cup destiny in his hands. How many of you sensed he was going to put it away? I did. I am not psychic and neither are you. We have just seen him do that sort of thing over and over again. Always with aplomb and always when it matters most. It was a stunning free kick and ultimately there proved to be no way back for Wimbledon. Of course the home side fashioned the almost obligatory last minute chance to rescue a deserved replay, or we allowed them to depending on whether you cup is half full or empty. This time our keeper proved more decisive and the danger passed. To be fair Mignolet had an improved second half. At the very least he showed he had the character to shake off his earlier mistake. Whether he is still out first choice keeper at the end of the window is another matter. You wouldn’t bet on it though. So at full time it was back to the studio and more breathtaking analysis. “Why couldn’t Brendan persuade Stevie to stay, just like Ferguson did with Scholes and Giggs?” It seems the dye is cast now, the editorial choices have been made, and every time Gerrard turns in a performance like that the same lazy and predictable questions will be trotted out. For me that’s a question for later. The decision has been made by player and club. History will judge if it was right or wrong. There may be factors that we know nothing about, we’ll just have to wait for the autobiographies to clear it up. What we can say with complete confidence is that we always knew this painful day would come, and constantly churning out the same old questions, only fills studios with hot air. What’s more important to me is the here and now. 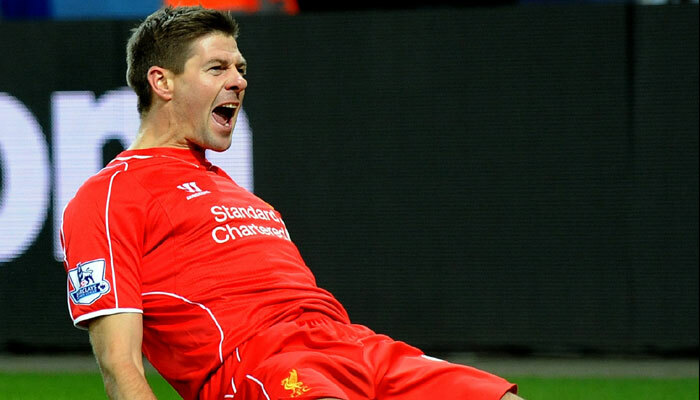 Rodgers deserves credit for pushing Stevie further forward tonight. He is far more dangerous in an attacking role, and against Wimbledon we got a glimpse of what we have missed this season. With the team so bereft of a cutting edge, perhaps Shearer and Linekar would have been better served asking why he hasn’t been deployed in an advanced role more often this term? Of course it is always easy to be wise in hindsight. Last season we didn’t miss his attacking powers because of the performances of Suarez, Sterling and Sturridge. Moving him into a deeper role seemed to make sense. This season the landscape has shifted, and we are no longer a potent attacking force. However, at least on the evidence of tonight’s performance we may have had a solution to our goal scoring problems sitting in front of the back four all . Could it be that in that role we have only been getting ‘Gerrard Light’. If so let’s hope we see the full strength captain more often in the remainder of the season. Makes you wonder how we’d cope without his heroics come next season. I also hope that his swansong will be with a trophy or two, after all he’s done, he deserves it. He’ll be a huge loss for sure.